The top Democrat in the U.S. Congress ordered a safety review for a Muslim lawmaker and her family Sunday after accusing President Donald Trump of putting her in danger by tweeting a video of her spliced with footage of the 9/11 attacks. House Speaker Nancy Pelosi took time out from an official trip to issue a statement urging Trump to remove the clip featuring Minnesota congresswoman Ilhan Omar. Pelosi’s statement came amid mounting pressure and harsh criticism from many in the more progressive wing of the party, who had blasted her for failing to condemn Trump’s tweet and unequivocally defend Omar by name in the days following it. On Friday, Trump tweeted a video that juxtaposed the snippet – which Omar’s fellow Democrats say was taken out of context – with images of the hijacked planes used in the attacks crashing into the World Trade Center’s twin towers that once dominated New York’s skyline. Menacing music accompanies Omar’s words. Prominent Democrats including Bernie Sanders, Elizabeth Warren, Beto O’Rourke, Kamala Harris and Omar’s fellow first-time Congresswoman Alexandria Ocasio-Cortez were quick to rush to Omar’s defense, accusing the president and other Republicans of deliberately de-contextualizing her remarks and endangering her life. Trump’s tweet was not the first time Republicans have appeared to try to associate Omar – one of the two first Muslim women ever elected to Congress – with the 9/11 attacks. The latest controversy arose after Omar delivered a 20-minute address to the Council on American Islamic Relations (CAIR) shortly after the New Zealand mosque attacks in March. 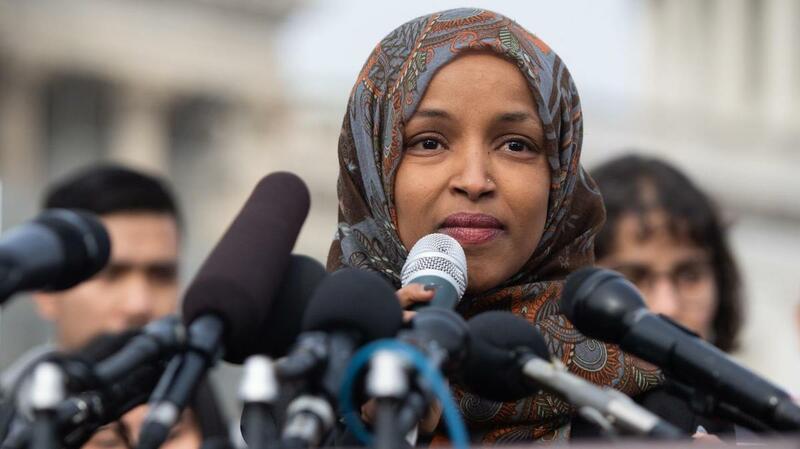 Omar mounted a trenchant fightback, tweeting Saturday: “No one person – no matter how corrupt, inept, or vicious – can threaten my unwavering love for America.